. Published on Thursday, December 1, 2016 . Being in a relationship during the winter can turn even the least romantic person into a gushy mess of emotions thanks to the generally cozy atmosphere of the holidays. If you find yourself coupled up this holiday season, make sure you and your significant other (S/O) go on at least one of these holidates. Maybe you and your partner are the kind of couple that enjoy going out and being seen. If that’s the case, trade the usual movie night in with a night out at an iconic movie theater in Los Angeles. You can catch holiday classics at a number of different theaters, from “Jack Frost” at the Egyptian Theater to “Home Alone” at The New Beverly Cinema. Festival of Lights in Downtown Riverside is something out of a holiday storybook. Complete with a vintage carousel, horse carriages and an ice skating rink, this annual event is the perfect place for you and your S/O to cuddle up and take part in all the winter festivities. If you find yourself deep in the city this winter, you and your partner can recreate those romantic, Hallmark movie-esque dates in the snow, here in LA. Head to The Grove to enjoy their nightly Magical Snowfall and see the shopping center transformed into a snowy, holiday hub. Disneyland gets the holidays started early; the park officially kicked off its holiday season on Nov. 10 with Holidays at Disneyland Resort. You can expect the usual attractions like World of Color—Season of Light. The park is bringing new features this year to make a more inclusive holiday experience, including the new Disney ¡Viva Navidad! celebration. Show what sophisticated young adults you and your partner are by hosting a holiday party for your other partnered up friends. You can dress to the nines and go with a swanky Audrey Hepburn style party. Family-gathering vibes more your style? Make it a potluck and chill by the fire pit! Give these vegan holiday desserts a try this year for a spin on the usual holiday classics. 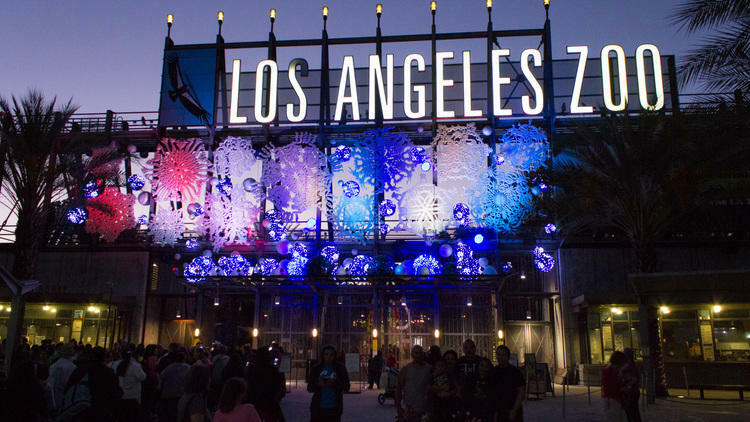 The Los Angeles Zoo is cute enough for a regular date, but have you seen the zoo when it’s lit for the holidays? Take a walk through the gorgeous light displays, fawn over the baby reindeer, feast on holiday snacks and get ready to take the sweetest couple photos that will make your friends instantly jealous. Everything is better when it’s lit, including Newport Beach. Going on its 108th year, the Newport Beach Boat Parade is an Orange County staple. Can you think of anything more beautiful than the lights of elaborately decorated yachts sailing across the harbor? Share this gorgeous sight with your partner this holiday season, starting Dec. 14. What’s more romantic than belting out the ultimate holiday tunes from Mariah Carey and Michael Bublé in style at a karaoke bar? You know you’ve been practicing since September anyway. First stop: Break Room 86 in downtown LA. We wait all year long for the two to three months in which it actually snows in California, so you best make the trip to the mountains and enjoy it! Choose from Big Bear Lake or Lake Arrowhead and visit the scenic villages for a picturesque snow date. Now you have an excuse to look cute in the winter clothes you’ve been hoarding. The couple that shreds together stays together, am I right? OK, regardless of skill level, winter sports can be a great bonding experience for you and your partner. You get to see each other fall repeatedly, freak out on the lift together, get locked out of your car in the snow (not like that happened to me or anything), all sorts of good stuff. Plus Groupon has great deals for snowboarding and skiing packages. How will you and your significant other be spending the holidays? Share with us using the hashtag #CampusCropChat on Facebook, Twitter and Instagram. Don’t forget to add us on Snapchat @ASICPP!